John Gillett (1801-1869) was the son of William and Mary Gillett of Brailes. John married Eliza Matilda Scuse (1804-1877), who was born in Minchinhampton, Gloucestershire, in 1827. She was the daughter of George Scuse (1768-1860; born Minety, Gloucestershire/Wiltshire), a maltster and wine merchant, and Elizabeth Beauchamp (1768-1845; born Long Ashton, Somerset). 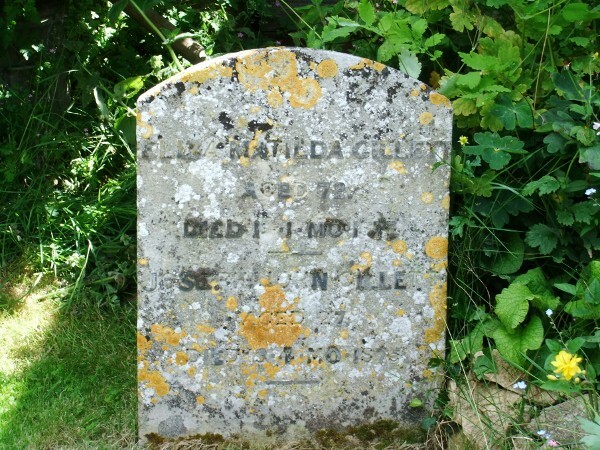 Eliza Matilda's siblings included: Caroline (1796-1880) who also married Joseph Fardon, Robert (1798- ), Mary Ann (1799-1892), Hannah (1802-1887), Georgina (1809- ). John Gillett died December 17 1869 at Portland Cottage (2 Portland Terrace), Cheltenham now 35 Prestbury Road. Eliza Matilda died January 19 1877 at 11 Albert Place, Cheltenham (subsequently re-numbered 16 and now a listed building) and was buried in Charlbury with her son Joseph John Gillett. John Gillett was initially a wine merchant, then took over his father's farm and plush factory in Brailes. He was also an inventor of agricultural implements - his patented clockwork bird scarer is exhibited at the Museum of Science in Oxford. He also exhibited at the 1851 Great Exhibition. 1. George Frederick Gillett married Hannah Smith (c. 1825-1909) in 1853. They arrived in Victoria, Australia after a 74-day journey from Liverpool on the New Brunswick-built clipper Marco Polo on January 25 1854. The Black Ball Line's Marco Polo was described at the time as the fastest ship in the world but she ran aground the next morning after losing her anchor while waiting for a pilot and was not freed until January 31. The 1871 census shows them in Gloucester with George as a merchant's clerk. They have three children, all born in Melbourne, Victoria, Australia: Victoria Flinders Gillett (1855-1923), Hannah Scuse Gillett (1858-1922) and Frederick Smith Gillett (1866-1892). 2. Emily Gillett married Aquila Warner (1846-1892) of Bristol, a grocer's assistant, at Charlbury in 1871. Aquila was born in Eastington, Gloucestershire and was possibly the son or nephew of Edwin and Mary Warner. Edwin was a grocer/draper in 1851 and an accountant in 1861. Emily and Aquila had a child, Marianna Smith Warner (1876-1942), died York, and both appear to have died in Bedminster (Gloucester/Somerset border) in March quarter 1892. Marianna S. Warner was a creamery assistant in the 1901 census, working at Smith & Co., "The Creamery", at 1 Cornmarket Street, Oxford with her aunt, Marian Smith, born 1866 in Charlbury as manageress (see below). In 1911 she was living in Headington with Sophia, Marian, Annie Caroline and her sister Kate's daughter. 4. Edward moved to Featherston, near Wellington in the North Island of New Zealand. He is not known to have married. Correspondence from others to the family at home suggested he may have had a struggle with alcohol. 5. 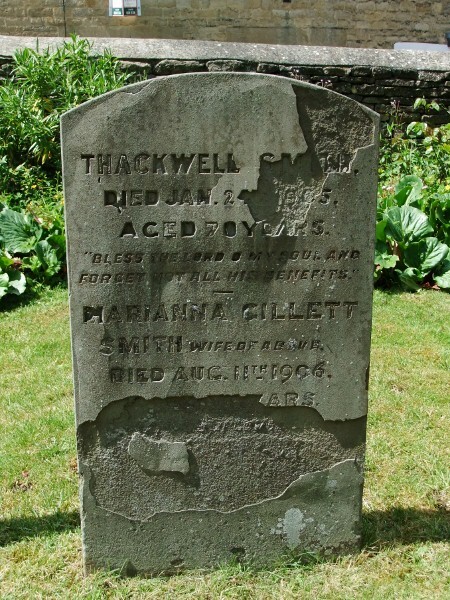 Marianna Gillett married Thackwell Smith (1834-1905) of Charlbury, a grocer, at Brailes on September 16 1860. Thackwell was born in Witney to Samuel Smith (born 1790), bacon curer and Hannah Tyler (born 1793) who married 12 October 1827 in Chipping Norton when Samuel was described as a cheesemonger. Hannah was the daughter of Joseph Tyler and Ann of North Newington, Oxfordshire. In 1841, Thackwell, aged 6, was living with his maternal uncle, John Tyler and family at Broad Street, St. Lawrence, Reading. In 1851, he was living in Bridge Street, Witney with his mother Hannah (48), grocer and draper, and sisters Lydia Ann Smith (c. 1830), Sarah Smith (c. 1834) and Ann Tyler Smith (c. 1837). Witnesses at Samuel and Hannah's wedding included William Coles of Chipping Norton, druggist (someone who prepared drugs for sale) and William Albright (1815-1909), draper of Charlbury. William Albright was a prominent Quaker and Thackwell's employer, who handed the business over to him in 1858. 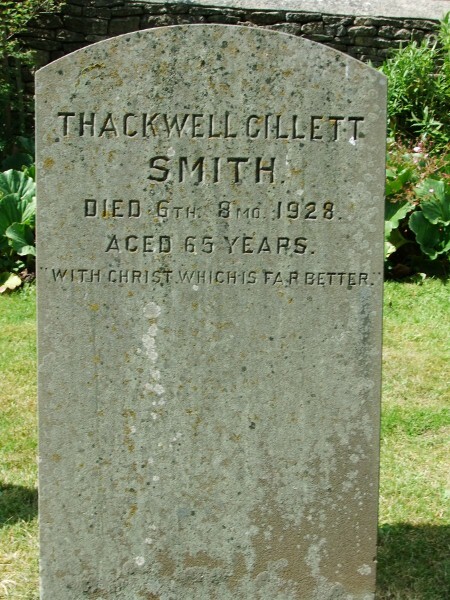 Thackwell and Marianna had: Thackwell Gillett Smith (1863-1928; died Chipping Norton); Hannah Eliza Smith (Lily) (1864-1951; died Chipping Norton); Annie Caroline Smith (b.1865); Marian Smith (May) (b.1866); Theodore Smith (1868-1869); George Scuse Smith (1869-1869); Kate Smith (1871-1906); Herbert Smith (b.1872); Frank Scuse Smith (1874-1934; died Wycombe); Sophia Smith (b.1876); and Arthur John Smith (1877-1948; died Oxford). 6. Sophia Matilda married Henry Charles Langbridge (1834-1922),an ironmonger of Hastings, at the Parish Church in Cheltenham on July 28 1868. Sophia Matilda died in London 1871. Sophia's husband was born 10 July 1834 and baptised at St Philips, Birmingham on 21 Aug 1834 he was the son of Henry Charles Langbridge (a Birmingham bookseller) and Sarah Sophia Lingham. After Sophia Gillett's death, Henry married Jane Collins in Hastings (1876). Jane Collins died in 1929 aged 95. 7. Eliza married Edward Jacob Walter (see The Family of Edward Jacob Walter and Eliza Gillett) and Robert Scuse was a witness. Both Eliza's parents died in Cheltenham. 8. Robert Scuse married Ada Mary Millard (c. 1843) in Cheltenham in September 1864. In the 1871 census they were living in Hay-on-Wye (4 Town Hill) where he was an ironmonger. They had two children: George John Gillett (1856-1936) and Robert Scuse Gillett (1868-1917), born in Droitwich, Worcestershire. An Ada Mary Gillett died in St. Saviour (now Southwark) in December quarter, 1873, aged 32 years. Robert died in Liverpool in December quarter, 1876 aged 35 years. In the 1881 census George was living with his aunt Marianna and her husband Thackwell Smith (46) at Church Street, Charlbury, Oxfordshire. Robert Scuse (12) was at Sibford School (Sibford Ferns, Banbury, Oxfordshire) - established as a co-educational school for the children of Quaker families in 1842 and still active. Based on the old Manor House at Sibford, it was bought from Joseph Harris for £1200 with money provided by Joseph Ashby Gillett, the older Robert's uncle. The younger Robert Scuse Gillett died in Melbourne, Victoria, Australia in 1917 leaving an estate worth £44,585 to his brother George as sole next of kin. The younger Robert was MD of Anthony Horden & Sons. Ada May Gillett (1888-1936). in 1911, Ada was working as a telephone operator and living at North Terrace, Hurstpierpoint, with her maternal grandparents, John Carvill (1828-1912), a house agent, Fanny Charlotte Lay (1843-1919), a telephone supervisor at exchange, and her aunt Annie Sarah Carvill, aged 39 (actually born 1868), a housekeeper. Ada married Frederick Botting and had a daughter Dorothy P K Botting in 1918. Charles Walter Gillett (born 1897, Charlbury) - telegraph messenger in 1911. Private in Royal Sussex Regiment killed September 3 1916. Buried in Hamel Military Cemetery, Somme, France. 9. Joseph John Gillett married Maria Annie Oldfield (born 1848), daughter of Thomas Oldfield at St Luke's Church in Cheltenham on January 3 1871. Joseph John died in Chipping Norton Registration district in 1875. Their daughter Ethel Mary Maud Gillett (1872-1947) married medical practitioner Walter Henry Pollard (1867-1952, born Derby) in Essex in 1895. Daughter Olive Marjorie Pollard (1896-1976) was born in Tollesbury Essex and son Wilfred Walter Pollard (1899-1918) in Smethwick, Birmingham. Second Lieutenant Wilfred W Pollard died in the RAF Hospital London on July 5 1918 and was buried at Birmingham (Lodge Hill) cemetery as were his parents. Olive Marjorie married Colin L Southall in 1922.